Description: Feel free to ask here any questions about Audio Comparer. Any suggestions are welcome! After doing a test run on a smaller directory I purchased the software. Now I get the following error when running on a large directory (the reason I purchased the software, a few hundred files I can manage myself). I'm running Vista with a 3 core AMD 720, 8 GB of RAM and 2 TB of storage. I just downloaded the software last night. 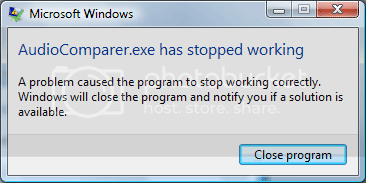 When the program crashes, it should ask for sending the bug-report by e-mail. Could you allow the program to do this? And one more: while we're trying to understand the problem, perhaps, it's useful to divide your collection into several smaller groups and compare them separately. It really doesn't get very far before locking up and if I have to start breaking up directories I'll need to go another route. If you e-mail me directly I will send the large .jpg of my screen. We're especially interested in the tab "Call stack" from bug-report. Faulting application AudioComparer.exe, version 0.0.0.0, time stamp 0x2a425e19, faulting module bass.dll, version 2.4.2.3, time stamp 0x49071b13, exception code 0xc0000005, fault offset 0x0000cd72, process id 0x668, application start time 0x01c9e32c87d940af. I am new to Vista 64 (working my way to the Windows 7 64) but I have a bit of experience with Windows and systems in general. I started with building SCO Unix boxes on the IBM AT 286 architecture in the early 80's and have tried to keep fairly current but off the bleeding edge ever since... So, your going to have to take my word that when the program errors it does not trigger the standard debug message and there are no .elf files in the programs root directory or anywhere else on the hard drive (this includes hidden and system directories). The software works fine on much smaller file sets, but can't seem to handle the task I need. I'm disappointed because in the tutorial there's a reference to a 40,000 file compare. I like to support independent programmers but I need to have a light at the end of this tunnel or I need to find another solution. Please let me know what you think you can do or please credit me for the purchase. There is actually "a light at the end of this tunnel". Somewhere in the middle of June there will be a new version released - the problem should be solved. You folks have my email address (you needed when I paid, and I've requested you contact me directly). I Feel it's inappropreate for us to continue this conversation in a public forum (but that seems to be your choice). Based on the software's inability to meet my requirements (requirements clearly stated on your site as advertisement) I respectfully ask for a refund. I do not wish to wait and see if the next version will resolve the issue. BillS wrote: You folks have my email address (you needed when I paid, and I've requested you contact me directly). I Feel it's inappropreate for us to continue this conversation in a public forum (but that seems to be your choice). No problems. Please, write to support@bolidesoft.com and specify your order number.